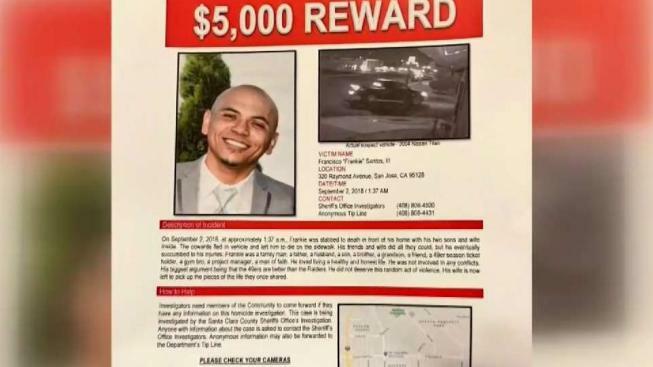 Frankie Santos Jr. was stabbed to death in front of his house on Sept. 2, but there’s been no update in the case until now. A surveillance photo from that night shows the at-large suspect's truck, a 2004-05 Nissan Titan, investigators said. It's a sliver of hope for his mother, widow and two children. Santos's wife said she's had to move out of her home because she doesn't feel safe there. She’s been raising money for a reward that soon will top $10,000 for information as new details emerge in the case. "They want to see their dad again," Sky Santos said about her children. "When we get there, my younger one says, 'Is Daddy here?' He still thinks he's there." Last Saturday, family and friends were passing out the updated flier near the Santos home when two men in a truck started threatening them. "Some of my husband's friends tried to follow the truck to get a license plate, and they shot a gun. The police went on a high speed chase with them and didn't find them until the next day and apprehended two juveniles from the vehicle." They're not believed to be the murder suspects. The slaying has nearby neighborhoods on edge and prompted a meeting with authorities at the Bascom Community Center Thursday night. "So they can voice their concerns," Santa Clara County Supervisor Ken Yeager said. "And if we can offer answers and solutions, we hope to do that." The Santos family is asking people one last time to check their surveillance cameras, hoping to catch the suspect. "It's life changing," Sky Santos said. "We no longer can stay in our home that have all of our memories, and whatever we have left of my husband and their father. I've lost everything." Deputies said there have been increased patrols in the Bascom Avenue and San Carlos Street areas over the past five weeks.